Capacity cuts and adverse geopolitical events in the competitive European market during the second quarter of 2016 led to a 9.4 per cent decrease in sales to 970.6 million euros (Q2 2015: 1.07 billion euros). Total sales declined in the first half of 2016 by 8.4 per cent to 1.71 billion euros (H1 2015: 1.86 billion euros). Stefan Pichler, Chief Executive Officer, airberlin, said: “While airberlin delivered on its goal to improve its cost structure, the second quarter of this year was more challenging than expected on volumes and yield. “The demand, especially on flights to holiday destinations, suffered from terrorist attacks in Europe and had a major and negative impact on airberlin’s financial performance. With up to one third of our revenue generated by leisure travel, the airline was hit particularly hard by the volatile political situation in traditional holiday destinations of Turkey, Greece and North Africa. “Although capacity was shifted to other Mediterranean destinations, such as Palma de Mallorca, and the Canary Islands, overcapacity in the Spanish market resulted in depressed fares compared to the previous year. “On the positive side, unit costs decreased by 3.3 per cent in the second quarter of 2016, compared to the second quarter of 2015. The net result in the second quarter decreased to -89.1 million euros (Q2 2015: -37.5 million euros) and to -271.5 million euros (HY 2015: -247.6 million euros) in the first half-year. Operating earnings (EBIT) decreased in the second quarter to -62.7 million euros (Q2 2015: -15.9 million euros), and compared to the first half of the year, declined by 34 per cent to -234.9 million euros (HY 2015: -175.8 million euros). The cash and cash equivalents balance as at 30 June 2016 increased to 398.2 million euros (30 June 2015: 219.1 million euros). Revenue per available seat kilometre (RASK) decreased in the second quarter of 2016 by six per cent, reaching 6.78 euro cents (Q2 2015: 7.20 euro cents). In the half-year, RASK dropped by 3.4 per cent, from 6.99 euro cents to 6.75 euro cents. airberlin continued to improve its ancillary revenues with a 27 per cent rise from 5.85 euros (Q2 2015) to 7.42 euros per passenger. Compared to the same half-year period last year, ancillary revenues increased by 28 per cent from 6.38 euros to 8.14 euros per passenger. The yield – from flight revenue per RPK – declined in the second quarter by 6.4 per cent to 7.33 euro cents (Q2 2015: 7.84 euro cents). In the first six months of the year, the flight revenue per RPK decreased by 4.4 per cent from 7.47 euro cents to 7.14 euro cents. The average fare fell by 5.8 per cent, from 116.2 euros to 109.4 euros. Compared to the same period of the previous year, the average fare declined by 4.3 per cent, from 117.2 euros to 112.2 euros. The load factor decreased by 0.4 percentage points to 81.6 per cent (Q2 2015: 82.0 per cent). Compared to the half-year, the load factor remained stable and, despite overcapacity and geopolitical volatility, decreased by only 0.2 percentage points to 82.4 per cent (Q2 2015: 82.6 per cent). In the second quarter, airberlin offered 14.32 billion available seat kilometres (ASK), with capacity planning adjusted to reflect demand affected by geopolitical events, represents a decrease of 3.7 per cent (Q2 2015: 14.87 billion), primarily driven by the reduction of flights to the affected markets mentioned above. Sold seat kilometres (RPK) fell by 4.1 per cent to 11.69 billion (Q1 2015: 12.19 billion). 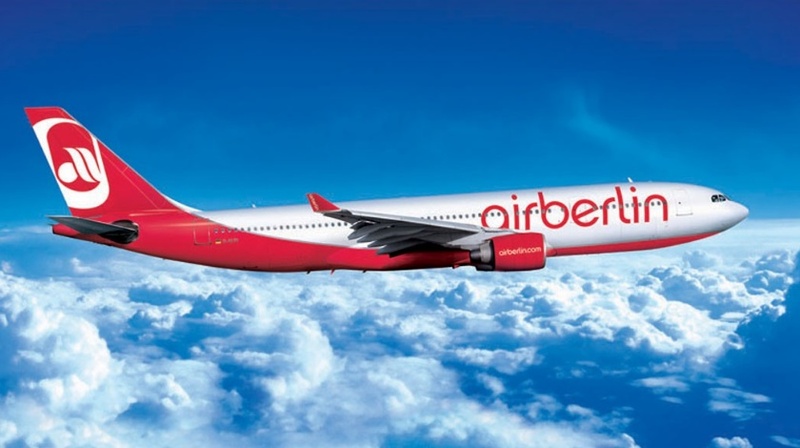 airberlin continued to focus on cost reductions, and benefitted in the second quarter of this year from a decline of 3.3 per cent in unit costs (CASK) from 7.51 euro cents to 7.26 euro cents. Total costs declined by 6.9 per cent to 1.04 billion euros (Q2 2015: 1.12 billion euros).